GAINESVILLE, Fla.—The College of Education at the University of Florida rode a substantial growth spurt in research funding to move up five spots to 24th in the nation in the U.S. News & World Report’s annual rankings of America’s Best Graduate Education Schools, released Tuesday (March 20, 2018). Among public education colleges, UF was rated 14th, also a five-place spike over last year. 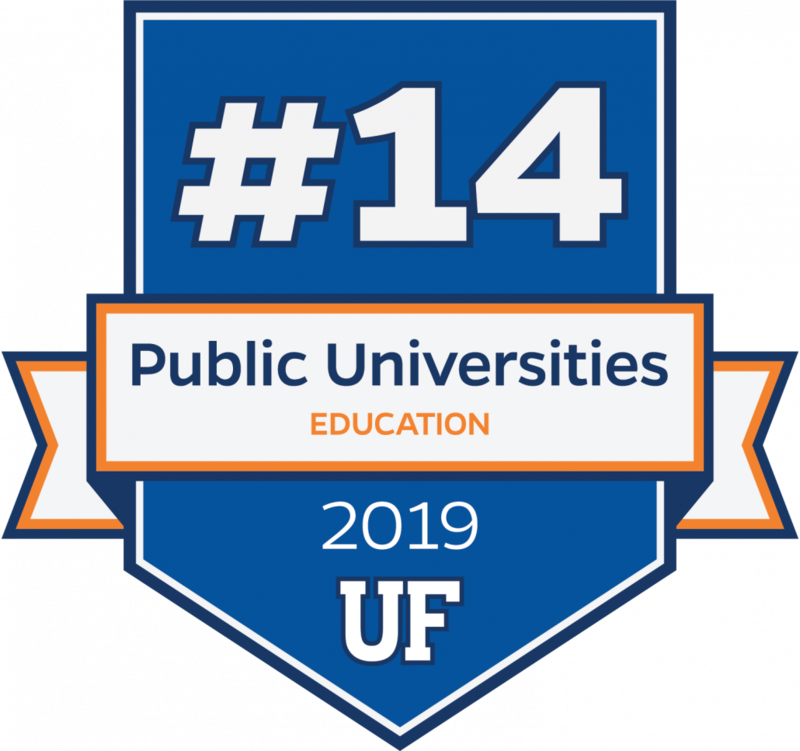 UF continues to stake claim as the top-ranked education college in Florida and among public education schools in the Southeast. Florida State, at No. 46, was the state’s only college of education besides UF to achieve a top 50 national ranking. Two UF academic education programs scored top-five rankings in their respective specialty areas: Special Education maintained its fifth-place rating from last year and Counselor Education moved up three spots to No. 5 in its category. For these rankings of on-campus programs, U.S. News surveyed 385 graduate education schools granting doctoral degrees, with 267 providing the necessary data to be calculated based on a weighted average of 10 key quality measures. UF’s College of Education registered sizable improvement in three key metrics of the survey—doctoral student acceptance rate (gauging admissions selectivity, considered an indicator of high-quality student enrollment), and two measures related to the college’s thriving funded research activity which accounted for nearly a third of the total ranking score. During 2017, the U.S. News report shows that UF education faculty researchers were awarded an all-time college high of $27 million in combined external grant funding, nearly $2 million more than the prior record-setting year. College faculty members averaged more than $443,200 each in the total value of grants they generated—a 16.5 percent increase over 2016 and also the largest amount in college history. The college also maintained solid marks in graduate student admission test scores, and in reputation surveys of peer scholars and education administrators across the state and nation. U.S. News also has ranked the College of Education’s distance education program first or second in the country for the past three years. “With our advances in research, our steadily improving rankings and the recent start of major renovation work on our historic Norman Hall building, it’s an exciting time to be at the UF College of Education,” Dean Good said. UF has invested state “preeminent university” funds in three high-priority research initiatives involving the College of Education—in early childhood studies, personalized e-learning, and Big Data informatics analysis of national educational trends and teaching practices. Algebra Nation, a novel, interactive online tutoring tool created by the college’s Lastinger Center for Learning, supports math students and their teachers in every Florida county and in six states. Education technology researchers have assembled a Virtual Learning Lab team of interdisciplinary experts to explore massive data sets to personalize virtual instruction for future math students and to adapt visual educational technology for visually impaired students. The efforts are supported by $10 million over five years from the Institute of Education Sciences. The college’s Anita Zucker Center for Excellence in Early Childhood Studies was instrumental in convening UF’s Early Childhood National Summit last year, bringing together more than a 100 early childhood leaders to create actionable solutions to the grand challenges facing our most vulnerable young children and their families. America’s best-selling author James Patterson, who funded scholarships for 21 UF teachers-in-training over the past five years, recently followed up with another contribution of $3 million to the College of Education. With his gift, the college is launching an ambitious literacy acceleration initiative—dubbed the James Patterson Literacy Challenge–aimed at doubling the number of schoolchildren in Florida who can read proficiently. The complete rankings of U.S. News & World Report’s 2019 edition of America’s Best Graduate Schools can be viewed online at www.usnews.com/grad.